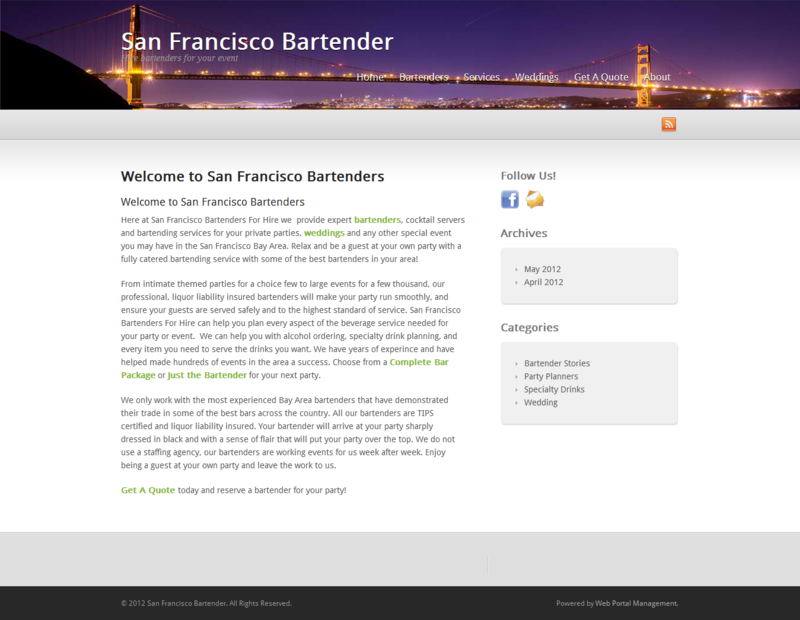 Here at San Francisco Bartenders For Hire we provide expert bartenders, cocktail servers and bartending services for your private parties, weddings and any other special event you may have in the San Francisco Bay Area. Relax and be a guest at your own party with a fully catered bartending service with some of the best bartenders in your area! From intimate themed parties for a choice few to large events for a few thousand, our professional, liquor liability insured bartenders will make your party run smoothly, and ensure your guests are served safely and to the highest standard of service. San Francisco Bartenders For Hire can help you plan every aspect of the beverage service needed for your party or event. We can help you with alcohol ordering, specialty drink planning, and every item you need to serve the drinks you want. We have years of experince and have helped made hundreds of events in the area a success. Choose from a Complete Bar Package or Just the Bartender for your next party.